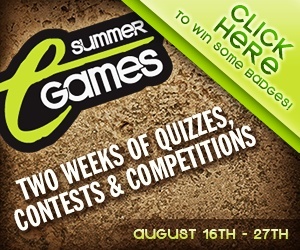 Compete in The Escapist's 2010 Summer E Games, Win Badges! Welcome to the 2010 Summer E Games! Every year, we scour the internet to find the perfect blend of fun and compelling community games and events. This year, we're bringing you all of your favorite games and events from last year, plus three new ones, recommended by our very own community. Play the games, participate in our events, and compete for the illustrious gold, silver and bronze badges. From quizzes to flash games to contests, we've got something for everyone. All of the events start today but make sure to check out our Timeline of Events to see how long some of the events are open. You don't want to miss out on the opportunity to snag a gold badge for your Escapist profile. Follow the link for how to participate, a timeline of events, and more. Head over to our main 2010 Summer E Games welcome page by clicking here. Good luck to all of this year's participants!